Coastal cities around the country are exploring structural engineering options for defending against extreme storms and the resulting surges of ocean water that cause massive flooding. Storm surge barriers or tide gates can effectively protect harbors and minimize flooding, property damage, and loss of life during large storms. These barriers typically span the opening to a harbor or river mouth and include gates that are only closed when storm surges are expected. However, even when gates are open, the barriers may reduce water flow and tidal exchange, which in turn could affect water quality and ecological processes. A study of this topic is currently underway in the New York metropolitan area, an area with highly valuable and vulnerable coastal infrastructure. 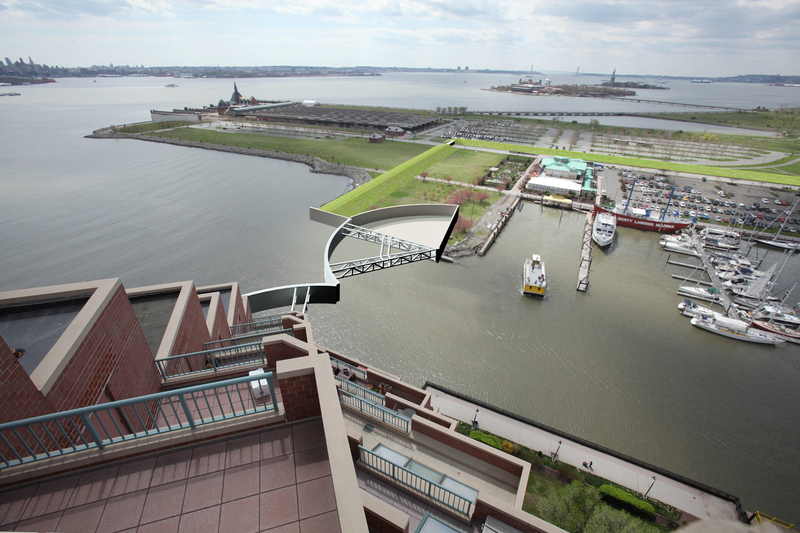 The U.S. Army Corps of Engineers, states of New York and New Jersey, and New York City are partnering under the Harbor and Tributaries Focus Area Feasibility Study (HATS) to evaluate surge barriers and other options to manage coastal storm risks. Scientists and engineers are increasingly recognizing the need for collaboration on research that more fully explores the advantages and disadvantages of large surge barriers. The National Estuarine Research Reserve Science Collaborative funded a “Catalyst” project for one year with the following goals: (1) to facilitate development of a collaborative research agenda that can help interested parties better understand potential barrier effects on nearby estuaries, and (2) to undertake targeted research in close collaboration and with information-sharing among scientists and key end-users such as the U.S. Army Corps of Engineers and its partners. The project team will conduct modeling and analyses of the physical influences of surge barriers and host a series of workshops to synthesize and share information. Improved understanding of the benefits and impacts of storm surge barriers on the Hudson River and the surrounding estuarine system. Enhanced engagement and collaboration among the research community to expand studies of storm surge barriers. More scientific input to the Harbor and Tributaries Focus Area Feasibility Study, allowing the Army Corps and its partners to consider a range of costs and benefits of surge barriers. Increased coordination and understanding between the scientific community and key end users in the New York metropolitan area, providing a foundation for future collaborative efforts. The project approach is designed to foster close collaboration and information-sharing among scientists and key end users. 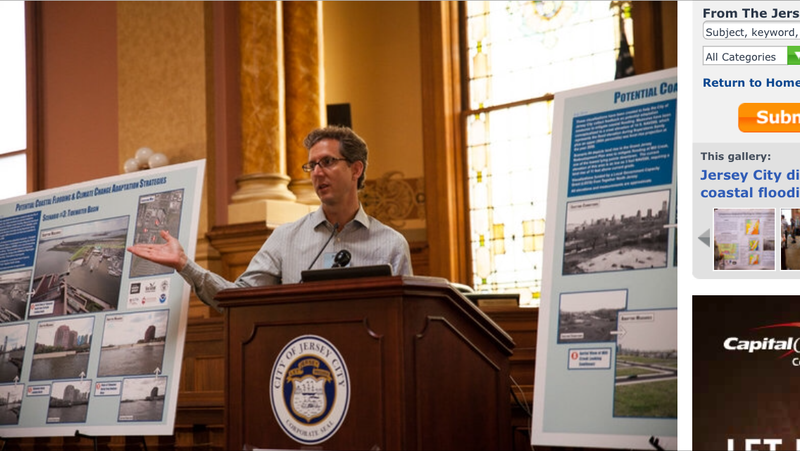 An advisory committee is providing input to the project team to ensure that data analyses and workshop plans are responsive to the needs of end users, such as the Army Corps of Engineers and relevant city and state agency offices. The project team is organizing a series of three to four workshops that will focus on framing the group’s collective understanding of the benefits and impacts of barriers, highlighting areas for future research or discussion, and catalyzing new collaborative research efforts. In addition to key end users and project advisors, the team is inviting additional experts on estuaries and surge barriers to some of the workshops to help address the specific topics and areas of uncertainty identified in prior meetings. The project team is summarizing workshop presentations and discussions into targeted reports and creating a future scope of work that will outline key research needs and lessons learned from the project. Concurrently, the team is conducting hydrodynamic modeling and scenario data analyses to better understand the physical and ecological effects of a surge barrier on the Hudson River estuary and provide the Army Corps with information to inform their study. The team has models of tides, wind waves, storm surge, and three-dimensional estuarine circulation, as well as a large database of historical simulations and hypothetical storm simulations and probabilities from a prior risk assessment study, which includes both coastal flooding and inland rain flooding along the Hudson. These modeling tools will be used to address specific questions of interest to end users, such as how different barriers would affect tidal range, salinity, stratification, wave impacts, or rain-driven flooding behind a closed barrier. A future scope of work laying out a three-year plan for conducting a comprehensive assessment of barrier benefits and impacts, as well as specific plans for funding next steps and filling research gaps. Urban populations and infrastructure have unique vulnerabilities to extreme climate events, and these vulnerabilities are projected to increase in the future. The major cities of the northeastern U.S. are at the vanguard of resilience efforts, in part with the aid of the Consortium for Climate Risk in the Urban Northeast (CCRUN). The primary goal of CCRUN Phase II is to improve these resilience efforts by scaling them to meet the scope of the adaptation challenge. Toward this goal, CCRUN Phase II has built an interdisciplinary team composed of climate scientists, engineers, and social scientists working in tandem with sector experts in coasts, health, and water. We will address three questions that lie at the interface between science and decision-making: 1) Which climate and climate impact information products most influence decision-making and adaptation action? 2) Which adaptation strategies are most effective for different urban populations and in different urban contexts? 3) What are the region’s key conditions (e.g., institutional, regulatory, infrastructural, and/or socioeconomic) that serve as opportunities for or barriers to, ‘ramping up’ meaningful climate resilience practice? As we develop answers to these questions, CCRUN will continue to provide state-of-the art climate risk assessment information, co-generated with the region’s stakeholders. By seeking answers to the above questions, and building upon efforts begun in CCRUN Phase I, the proposed work supports multiple NOAA CSI research objectives relevant to this Competition: 1) understanding decision contexts for using climate information (through responsiveness to stakeholder needs, with an emphasis on participatory processes and relationships); 2) developing actionable knowledge through interdisciplinary research (an outcome of the strong ties linking our sectors and cross-cutting themes); 3) maintaining diverse, flexible networks for sharing knowledge (e.g., through regional partnerships with the DOI NE Climate Science Center and NOAA NE Regional Climate Center); and 4) innovating services to enhance the use of science in decision-making (e.g., through new web tool and data sharing plans and platforms). The Phase I work of the Coasts Sector team for the “Consortium for Climate Risk in the Urban Northeast” project fit into three categories – (1) storm surge modeling and physics, (2) dynamic model-based flood risk assessment and mapping with climate change and sea level rise, and (3) quantitative analysis of coastal flood adaptations. We studied these topics across the U.S. urban Northeast corridor, including Philadelphia, New York, Boston, and cities in between. CCRUN is the project and base funding that has supports much of my position at Stevens, since I arrived in late 2010. Therefore, the header’s TOPICS link summarizes the range of research which has been done so far and can be attributed at least in part to CCRUN. In phase II of CCRUN, the coastal sector team will improve the resilience of cities along the Northeast urban corridor through three main thrusts – (1) improving the “forecasting the future” layer of resilience through ensemble forecasting and hazard assessment, (2) improving the metrics of resilience, and (3) better communicating the forecasts of hazards and the metrics of resilience. All three are aimed at one focal point: Informed, improved decision-making on coastal urban resilience. Principal Investigators Philip Orton, Nickitas Georgas, Alan Blumberg, Stevens Institute of Technology; James Fitzpatrick, HDR, Inc. Hundreds of thousands of NYC residents in Jamaica Bay’s watershed live on land vulnerable to flooding from a hurricane storm tide. Many types of coastal protective features, ranging from surge barriers to natural features like wetlands and oyster beds, have been suggested as solutions for coastal flooding around the bay. Water quality and storm damage avoidance are integrally linked research topics, as storm protection efforts can harm water quality and alter ecosystems. A project is outlined here to improve upon existing mathematical computer modeling capabilities for Jamaica Bay and to run experiments to study climate change, sea level rise and coastal adaptation impacts on water quality and storm damages. An important part of the project plan is to build Jamaica Bay Science and Resilience Institute consortium technical capacity by making these models available for consortium member use. Hurricane Sandy was a painful reminder that coastal storms are among the world’s most costly and deadly disasters, capable of causing tens-to-hundreds of billions of dollars in damages and destroying entire neighborhoods. 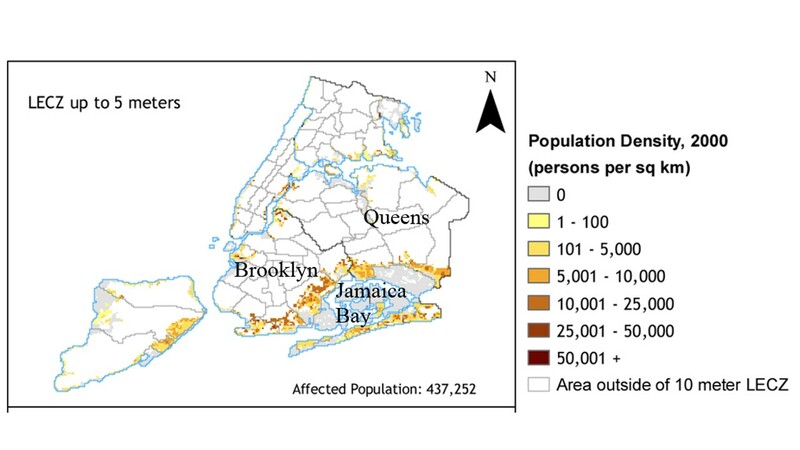 For New York City, hundreds of thousands of NYC residents live at low elevations (below 5 m) surrounding Jamaica Bay, a bay situated on the south-east edge of the city. Jamaica Bay has an area of 107 km2, is ecologically rich, and has some of the largest remaining tidal wetlands in New York State. However, aerial photographs from 1974 to 1999 show that 2.5 km2 of marshes in the bay’s interior and nearly 80 percent of the interior islands vegetative cover disappeared over this period [Hartig et al., 2002]. The total loss of interior wetlands for the bay since the mid-1800s is estimated to be 12000 of the original 16000 acres [DEP, 2007], and the bay once supported a large oyster fishery producing 700,000 bushels of oysters per year in the early 1900s [Franz, 1982]. Many types of coastal protective features, ranging from surge barriers to natural features like wetlands and oyster beds, are being studied as solutions for coastal flooding. Decisions on which coastal protections to use require detailed studies using computer models that are not available or fully developed for most locations. These models must include many features in addition to physical storm surges, such as chemistry and water quality, to be able to evaluate whether water quality and ecosystems will be harmed by the protections. Mathematical modeling is useful for understanding water circulation, waves, flooding, water quality, and ecosystem dynamics, among other topics. Model experiments can reveal dynamics of each of these systems, within the constraints of a given model construct. Modeling connects with observations, which are used for model development and validation, yet are also interpolated in time and space by the model, to provide a more complete picture a water body, such as Jamaica Bay. As a result, modeling has major benefits for any comprehensive analysis of the bay, such as for quantification of flood damage reductions. Modeling also connects with decision analysis, as it opens the door to experimentation to understand future changes due to climate change, sea level rise, and human alterations around and within the bay. A project is outlined here to improve upon existing modeling capabilities for water quality, flooding and waves for Jamaica Bay, and to run experiments to study climate change, sea level rise and coastal adaptation impacts on water quality and storm damages. An important part of the plan is to build Jamaica Bay Science and Resilience Institute consortium technical capacity by making these models available for consortium member use at CUNY’s High Performance Computing Center (HPCC). Improve the existing water quality modeling in Jamaica Bay (J-Bay) with enhanced model representations of wetlands, macro-algae, and wetland and benthic chemical/nutrient fluxes. 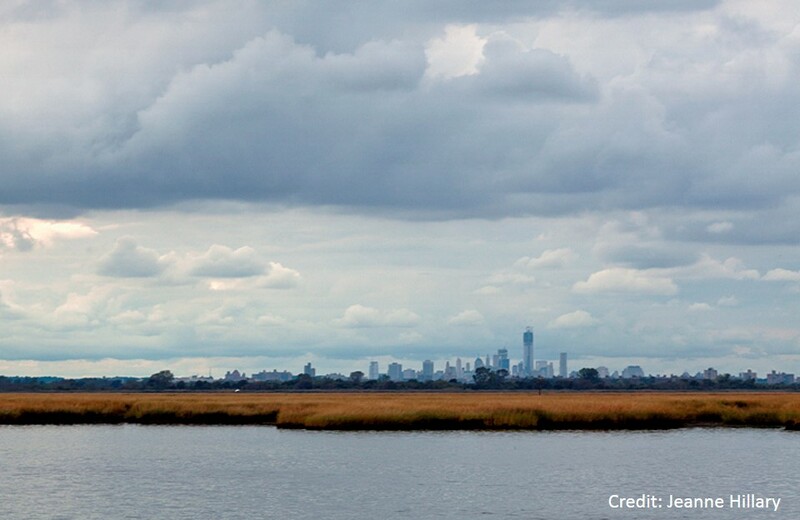 The two-year project brings together some of the best ocean and water quality modelers from the region, leveraging extensive experience with Jamaica Bay. It will also include an educational research component and be carried out, in part, by a PhD student and a post-doctoral researcher. DEP (2007), Jamaica Bay Watershed Protection Plan, Volume 1, New York, 128pp pp. Franz, D. R. (1982), An historical perspective on mollusks in Lower New York Harbor, with emphasis on oysters, Ecological Stress and the New York Bight: Science and Management. Columbia SC: Estuarine Research Federation, 181-197. Hartig, E. K., V. Gornitz, A. Kolker, F. Mushacke, and D. Fallon (2002), Anthropogenic and climate-change impacts on salt marshes of Jamaica Bay, New York City, Wetlands, 22(1), 71-89.